I’m breaking my race review into a couple of parts. 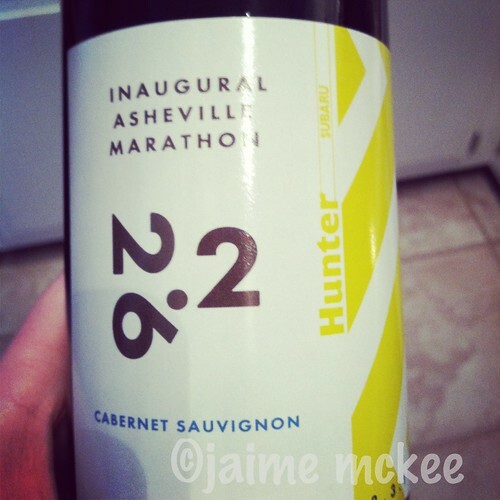 The expo was held the day before the marathon and I felt it deserved it’s own special update. 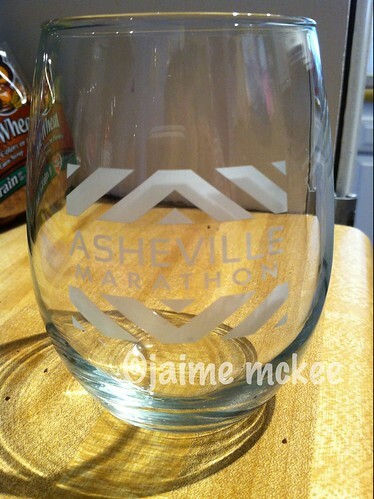 I ended up buying a bottle of wine and an Asheville Marathon glass (a stemless wine glass, but you know I’ll be drinking whatever out of this glass.) 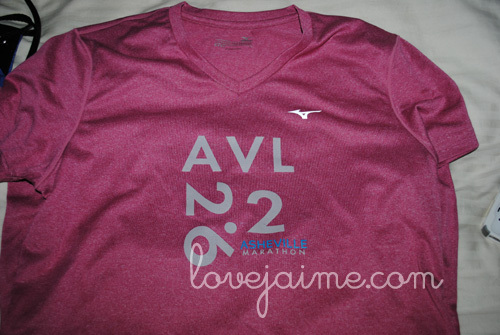 I also purchased a race shirt. 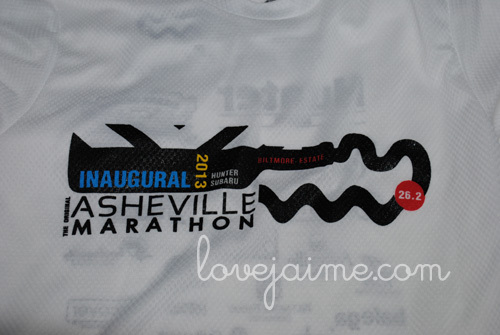 Pricey at $25, but once I saw the official race shirt, I was so glad I bought a different shirt. The lines to get our bibs were long and confusing. The signs were on the table, but should have been on a wall behind the tables. Apparently there was a table for Biltmore Estate tickets – which we should have received to even get onto the estate the next morning – but we didn’t see the person handing out the tickets. I didn’t even KNOW about the ticket until about 8 that night, when I was reading through the paper telling me what I needed the next morning. There was one last table on our way out, and a woman handed us each another bag, and a free pair of gloves. 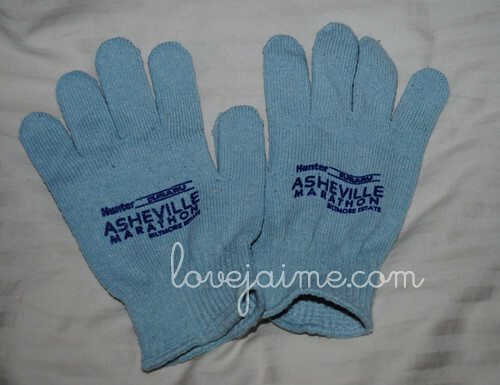 The gloves came in handy, as I used them to layer with my running gloves. 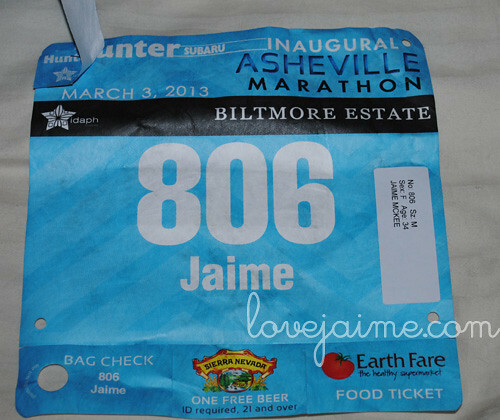 When I was reading the information that night, I noticed that they would not only be checking for our bibs, they were checking IDs (to match the bib names) and looking for the Estate tickets. Suzanne and I did not receive the tickets, but one of our friends did – that’s how we figured out where the ticket woman was. It wasn’t well organized. For a local race expo, I would rate them as a B+. It was too crowded and not the most organized I felt it could have been. I feel like if they had separated the number pick up from the room with all of the sponsors – or even moved the official merch tables into a separate area, it would have alleviated some of the congestion. Coming up later today (I hope): the race report. hopefully they’ll learn and get it together for next year! Ugh. Sorry about the race shirt and chaos at the expo. The glassware you got though is pretty sweet.